The derivatives market is an enormous off balance sheet completely unregulated global casino. The size of the market is so large and terrifying that political leaders around the world stay as far away from it as possible when potential regulations are discussed. They do not want to run the risk of awakening a sleeping giant. You may be asking why someone would want to "swap" for a fixed rate when they could just keep the lower fluctuating rate? By doing so, they would not have to send the bank all that extra money every month for the fixed rate payment. The answer is peace of mind. Imagine you are a small business owner who is willing to take on the risk of a fluctuating interest rate when you are first beginning. The reason is because you do not yet have a full understanding of your ongoing cost structure in the early stages of operations and your total debt burden is low. After about a year, you can begin to project forward both income and expense growth. You know that your business can withstand an interest rate on the debt of 5%, but if rates were to rise significantly above that amount you would begin to run into trouble. You then enter into a swap agreement that makes you pay a higher rate in the short term (5%), but you know that if rates cross above that level, the bank you entered the agreement with will cover those additional costs. It's like an insurance contract against market risk. In the meantime, the bank loves the arrangement because they just pocket the spread between your current interest rate (say 3%) and the fixed 5%. It is free money the banks are creating, boosting bonuses month after month. Banks go out and enter into these contracts with state and local governments, corporations, and other banks around the world. These banks have told us that they have "hedged" all their bets with other offsetting trades so that if rates were to rise significantly, they would be protected. There are two main problems with this. The first is that there is no regulator in place to monitor the banks activities in these markets. The banks tell us that they are protected and we just believe them. We only find out if a bank was not fully hedged if something goes wrong. The largest banks in the country all had hedges in place to cover subprime mortgage losses back in 2008 to partially offset any potential decline in prices. The problem was, unknown to all the banks when they entered the insurance agreements (called Credit Default Swaps), that many banks concentrated their bets heavily with an insurance giant called AIG. AIG wrote protection contracts that allowed them to take in huge annual insurance premiums. It was a perfect business model, until the storm arrived. Then investors, banks, politicians, and citizens found out that AIG had no capital in place to pay out losses when they arrived. The Federal Reserve stepped in and made the derivative payments out to the banks, which were close to $200 billion in size. The AIG incident represents the second major problem. The "net exposure" thesis for banks is based on there being no break in the collateral chain for any entity that is supposed to pay another entity. If a bank or hedge fund has taken on a interest rate derivatives position that triggers their own bankruptcy, then every entity that had a contract in place with them is now no longer hedged. Think of the small business owner above. What if rates crossed above 5% and the bank called them up and said unfortunately they did not keep enough reserves available to make their payment. The bank is going to have to close its doors. The small business owner is still on the hook for the interest rate payments above 5%. Even though those losses were "hedged" on paper, when the break in the collateral chain occurs the losses become real. This very simple walk through shows why there will be no more failures moving forward. Lehman was the wake up call and it will never happen again. The market will continue to grow until a break in the chain becomes too large for even the governments and central banks to handle. Do you think that is impossible? Let's look at how large the market is. The following table shows the derivatives exposure for just the four largest banks in the United States. Click for a larger image. The third column shows the risk based capital available to cover potential losses in these markets. The markets would need to move 0.2% against JP Morgan's book for their capital base to be wiped out. The total size of the entire United States economy is about $16 trillion. Remember that the United States has no cash available to cover losses. The government currently owes $16.8 trillion in debt and only survives off the kindness of the bond market (credit card) every month to stay alive. Who will come to the rescue of JP Morgan for losses on a $70 trillion derivatives balance sheet? 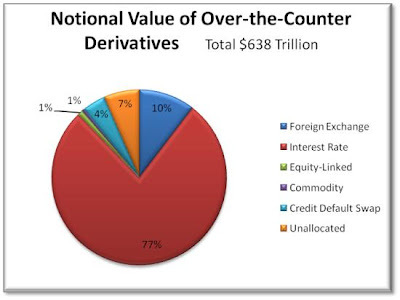 The following pie graph shows the total derivatives exposure the banks hold around the world, currently standing at $638 trillion. The entire global economy is just over $70 trillion in size. The derivatives market is 9 times the size of the entire global economy! 77% of all derivatives are interest rate contracts (the items just discussed above). After a 32 year steady decline in interest rates, everyone around the world now assumes that rates will either stay low or continue to fall forever. That was until last month when they unexpectedly spiked higher, sending shock waves around the world. What if rates continued to rise, not for days, but for years? (Hint: they will). Do you think it is possible that there is one entity on the entire planet that may have taken on too much exposure to interest rate risks in the derivatives market? Remember AIG? This is just one of countless reasons why central banks will do everything in their power to artificially keep rates lower, and it is by far the most catastrophic event that will occur when they finally lose control of the markets.